SeizureTracker.com - Using Seizure Tracker to keep track of appointments. Appointments logged into seizure tracker appear as a yellow back ground in the calendar based navigational interface. 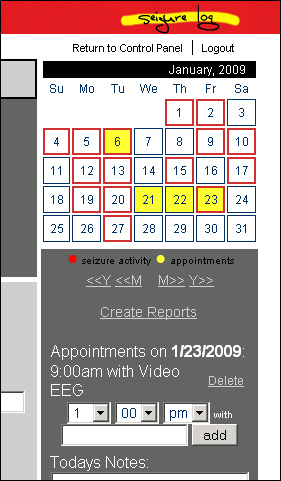 The Appointment log tool is located on the right side of the daily seizure logging page. Simply enter in the time and title of the appointment, click the submit button and the appointment will appear on the calendar interface.